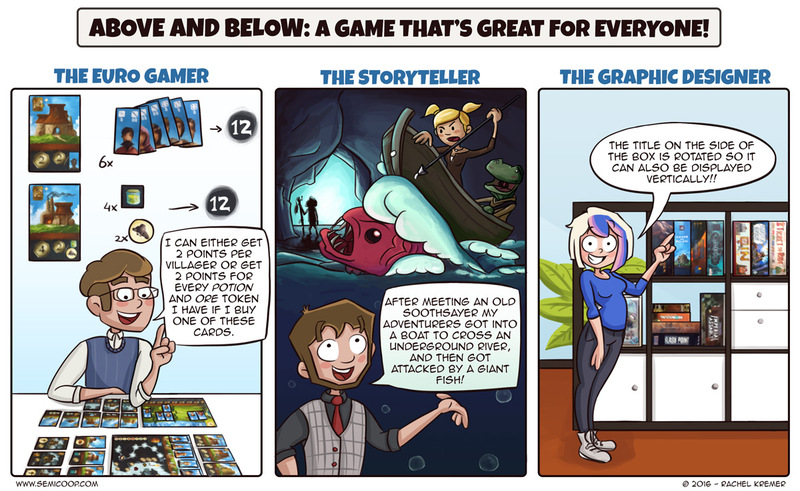 We bought Above and Below a couple of weeks ago and so far we really enjoy it! It seems like the sort of game that really shouldn’t work because worker placement and a choose-your-adventure mechanic are two things that shouldn’t mix but it does! We can’t wait to introduce it to different friends because it’s really nice. That feeling of niceness is just everywhere in this game, from the colourful art and architecture, to the amount of thinking you have to do. You’re just having fun admiring each others adventures and buildings, until the scoring phase of course. 😉 It does a great job immersing you into it’s world while the play time is only an hour. 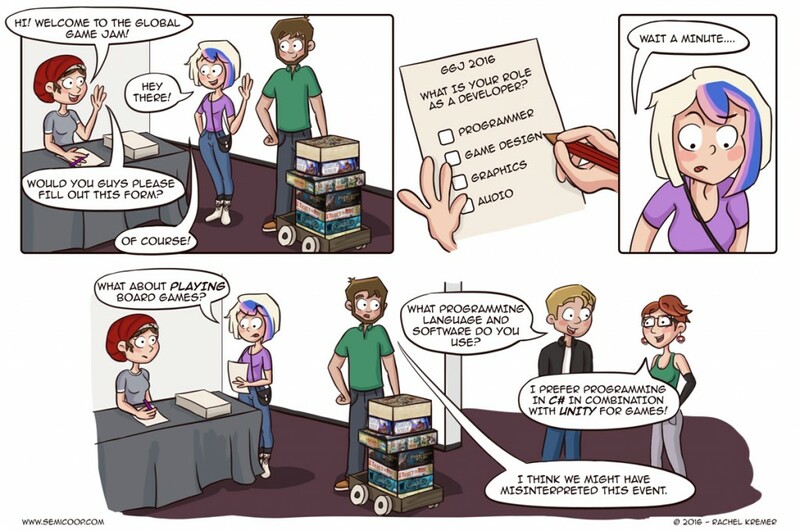 The most amazing part is that is what in the videogame industry would be called an indie game. Ryan Laukat did the design, the artwork, the publishing and only got some help on the writing. That’s probably why every detail matches the whole of the game, it’s the vision of one man. The only downside to the game that it has some kickstarter exclusives that sound amazing! Lost villagers, extra quest books: we need it! So if you know somebody that will be able to sell or gift us these items, we might feature you in a future comic! What are two game genres you would like to smash together into something glorious? I Just got this Saturday and was out of town and didn’t get it until Sunday. (luckily no one ganked it off my front porch) Played it last night and it was fantastic. I couldn’t agree with this more!!!!! I read on BGG that in the upcoming Kickstarter for Near and Far, it will be possible to pledge for the KS exclusives for Above and Below. Worth keeping an eye on! That’s cool! Since we’ll probably be backing it anyway, I don’t seem any harm in throwing more money at Red Raven Games :).